Robots in the Classroom: How a Program at Michigan State Is Taking Blended Learning to New Places — from news.elearninginside.com by Henry Kronk; with thanks to my friend and colleague, Mr. Dave Goodrich over at MSU, for his tweet on this. Like many higher education institutions, Michigan State University offers a wide array of online programs. But unlike most other online universities, some programs involve robots. Here’s how it works: online and in-person students gather in the same classroom. Self-balancing robots mounted with computers roll around the room, displaying the face of one remote student. Each remote student streams in and controls one robot, which allows them to literally and figuratively take a seat at the table. Professor Christine Greenhow, who teaches graduate level courses in MSU’s College of Education, first encountered these robots at an alumni event. “I thought, ‘Oh I could use this technology in my classroom. I could use this to put visual and movement cues back into the environment,’” Greenhow said. 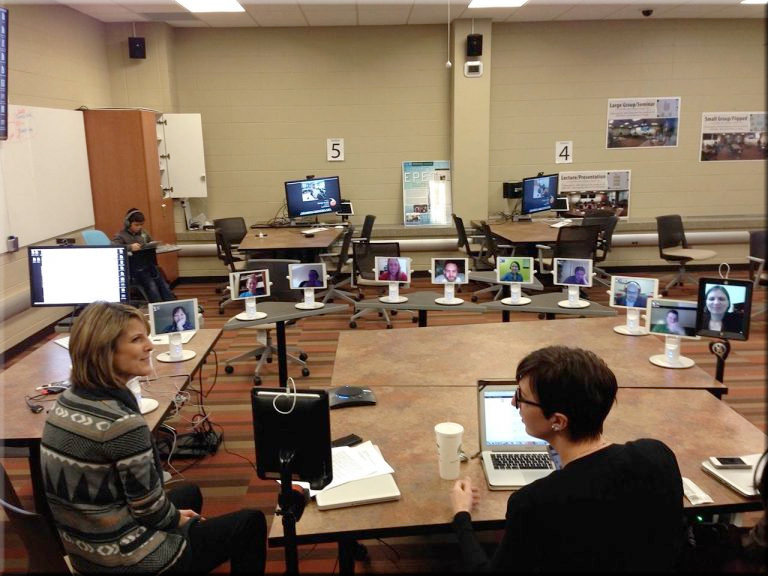 In my work to bring remote learners into face-to-face classrooms at Calvin College, I also worked with some of the tools shown/mentioned in that article — such as the Telepresence Robot from Double Robotics and the unit from Swivl. I also introduced Blackboard Collaborate and Skype as other methods of bringing in remote students (hadn’t yet tried Zoom, but that’s another possibility). As one looks at the image above, one can’t help but wonder what such a picture will look like 5-10 years from now? Will it picture folks wearing VR-based headsets at their respective locations? Or perhaps some setups will feature the following types of tools within smaller “learning hubs” (which could also include one’s local Starbucks, Apple Store, etc. )?